Help Nepal Relief will jointly work with local and volunteer engineers to build temporary shelter till the permanent houses to be built. In rural areas, most of the buildings that were made of stone or brick masonry with cement or mud mortar have all been completely destroyed. To avoid this from happening again, the reconstruction plan in rural areas should be divided in two phases. Post-earthquake, most people in rural areas cannot immediately afford a costly house which can last many years. Since, they have no shelter and as the rainy season is coming soon, they should be helped to build a temporary house at or a nearby location where they had their lived previously. Such houses could be made of cement mortar, be a one-storeyed brick or stone masonry structure (based on availability) with tin roof with wood (local) false ceiling. The houses can make use of established earthquake-resistant masonry building. 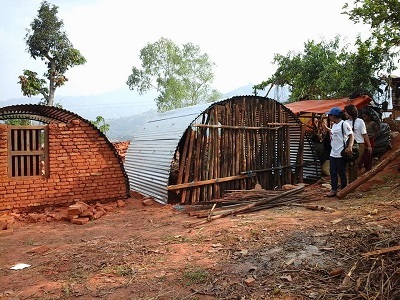 As the cost of these buildings will not be high as they can be made by using local materials, except for cement and tin-sheets for the roof. This will help people live close to their farms and also continue working on them. We can estimate the approximate cost of the building and think of further optimization later.